It is with great pleasure that we announce Bertha Espinosa-Garza as new principal of Golfcrest Elementary School. She has been a part of Team HISD for 16 years, serving the elementary level as instructional specialist, literacy coach, and bilingual teacher. Most recently, she served for two years as assistant principal of Briscoe Elementary School. 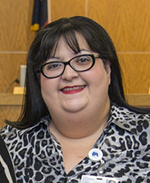 Mrs. Espinosa-Garza completed her undergraduate studies at the University of Houston-Downtown and her graduate studies at Concordia University in Austin. She received her bachelor of science in Bilingual Education and her masters in Educational Leadership. This entry was posted in Staff updates and tagged Golfcrest ES on June 14, 2016 by HISD Communications.